BBQ pepperstix have a mild flavor that kids love. A little more sweetness like the Kansas City BBQ! 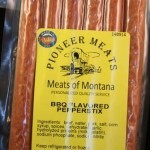 Enjoy them right here at home from Pioneer Meats in Big Timber, Montana.